When camp opened a few weeks ago, 59 players reported to Major League Spring Training with the St. Louis Cardinals. Grapefruit League play is now two weeks old and the spring training roster is down to 46. There are plenty of story lines that have developed over the progress of 14 days. Oscar Taveras did not show the break out spring the organization was looking for and was optioned to Triple- A on Thursday. Stephen Piscotty is locked in and has impressed at the plate, but barring strange circumstances, will start at the Triple-A level. Carlos Martinez has made things interesting for the final spot in the Cardinals starting rotation. He has allowed just five hits and two earned runs in 10.0 innings as a starter thus far. Lance Lynn took the mound yesterday and struck out 10 batters in 4.0 innings, including eight K’s in a row to end his outing. The Cardinals made a bold move by signing Cuban infielder Aledmys Diaz, who did not appear in a game during the 2013 season. The list could continue, but the bottom line is that the team has for the most part remained healthy and strong through the first few weeks. The Cardinals started optioning players at the beginning of the week, moving ten total so far. Three of them, RHP Angel Castro, OF Mike O’Neill and OF Rafael Ortega, were placed on the Triple-A Memphis roster. Of the other seven, RHP Boone Whiting (pictured above) is the one that should be noted. 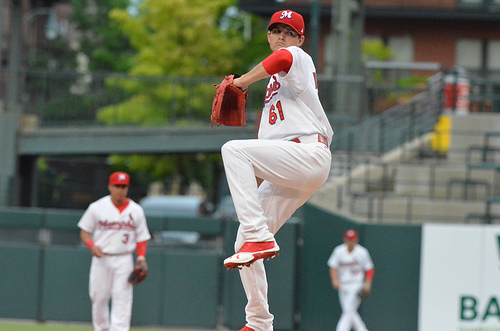 It was a bit surprising to see Whiting not placed on Memphis’ roster after he made 21 starts for the Redbirds in 2013, going 5-5. Projections had him as one of the five starters to begin with Memphis, but he could see a quick promotion similar to last year (more information on the starting rotation and bullpen will be up next week on the blog). St. Louis has since optioned only three players, all on Thursday and all to Memphis. 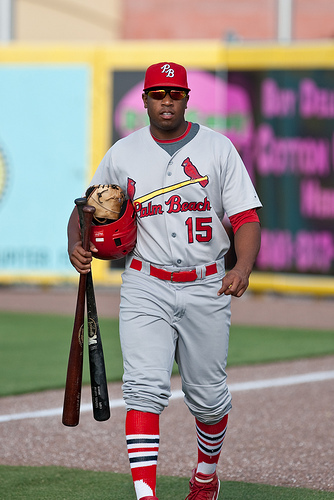 As mentioned above, OF Oscar Taveras was most notably moved, joining RHP Eric Fornataro and C Audry Perez. As for the remainder of the Memphis roster, things are still up in the air, but the forecast of players may be foreseeable. With Taveras locking down one of the outfield spots, most likely right field, it is expected that Piscotty and Randal Grichuk (pictured above) will join him. Grichuk has appeared in 61 games at center field in the past two years and will more than likely anchor that spot for Memphis. Seeing Piscotty succeed as he has in spring training is exciting to witness, but Cardinals’ manager Mike Matheny has hinted at a start at Triple-A for the outfielder. O’Neill is a contact hitter that may fill a spot early in the season if Taveras is not healthy enough to go right away. Otherwise, expect him to be a bench player with the opportunity at pinch hitting. The real surprise of the moves thus far was seeing Ortega placed in Memphis. Ortega did not do much in his six at-bats in spring training, plus he hit only .228 last year with Double-A Tulsa in the Colorado Rockies’ organization. Offseason-signee Joey Butler was predicted to fill a fifth outfielder spot on the Triple-A roster, but he has not been moved from Major League camp yet. The former Texas Ranger has spent the past three seasons as an opponent of the Redbirds as a part of Triple-A Round Rock. With Ortega landing on the Triple-A roster it does mean that 2012 1st round pick James Ramsey will probably start with Double-A Springfield. The signing of Diaz on Sunday piled more questions on an already packed infield. Though he is not able to compete in Cardinals spring training games because of work visa issues, it was reported he would get some action in minor league games soon. It was said that the infielder would begin in a high level of the St. Louis system, but that will be Double-A more than likely. In addition to Diaz, fans can expect many new faces on the infield. Scott Moore, Greg Miclat and Xavier Scruggs (pictured above) are slated to begin in Memphis. Moore has Major League experience with three different clubs, but spent the 2013 season in Triple-A with Tucson and Sacramento. He has experience at first base, third base and as a corner outfielder. Miclat was a Rule 5 pickup by St. Louis from Texas. 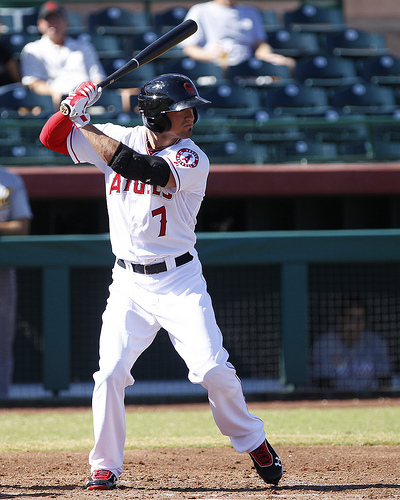 The middle infielder spent the majority of 2013 with Triple-A Round Rock as a teammate to the above-mentioned Butler. Finally, Scruggs is a first baseman who has been in the organization for the last six years. He has shown terrific power (22 HR in 2012, 29 HR in 2013) through the years and actually holds the Springfield Cardinals home run record, a feat he achieved on the last day of the regular season in 2013. The downside to Scruggs is that he strikeouts a lot (177 times in 2013) and has not hit for a high average yet. The way he is hitting in spring training should be a cause for excitement though. Those new additions should team with the more familiar, namely Jermaine Curtis, Greg Garcia and Vance Albitz, to man the infield. If there was to be an odd man out, it would be Albitz. He was back-and-forth between Springfield and Memphis last season and could use the at-bats at Double-A. Backstops are as set as they could be with Perez and newly-signed Ed Easley (pictured above). Perez got experience as a late-season call up in 2013 and appeared in 25 games with Memphis before that. Easley had spent the past seven seasons apart of the Arizona organization but signed with St. Louis in the off-season. 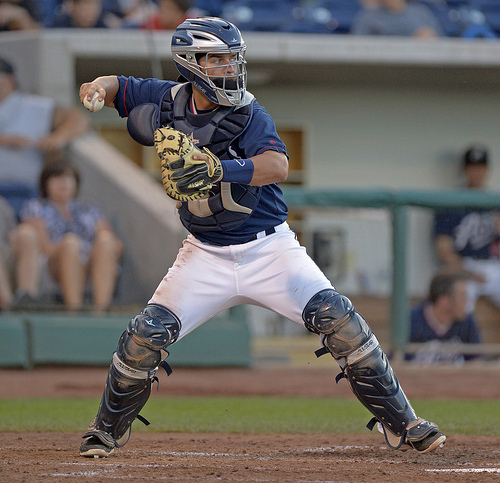 He led all Pacific Coast League catchers last year by throwing out 35.7% of attempted base stealers with Triple-A Reno. Rosters will continue to fill out quickly with more moves in the coming days and weeks. In the end, Triple-A Memphis, as always, will feature a surplus of young talent looking to prove themselves.